"DARWIN ROCKS! 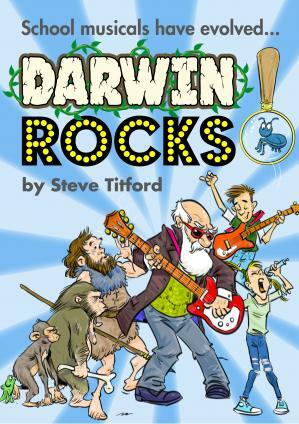 After the brilliant "Shakespeare Rocks" we thought we'd never find anything to equal it but then came "Darwin Rocks"!!! A totally amazing show, once again doing for our children's acting, singing and dancing what J.K. Rowling did for their reading. Imaginative, great fun and inspiring. The children loved every minute of the preparations and performance. The parents were delighted!!! An enormous thank you to Steve Titford and Musicline for understanding how to make putting on a fabulous show so painless and enjoyable! What an end to the school year! Theresa Jane Patterson"
"A fantastic end of year show, catching songs and the children loved performing it! Nothing beats being you and Tierra del Fugueo are great finale songs with great meanings. We had some great reviews and we loved every minute of putting the show together and performing it! Thank You Steve Titford and Music Line!" "Being the first school to ever perform this show, we had no testimonials upon which to rely or ideas to magpie from other schools. We needn't have worried, however, as Steve Titford has created yet another amazingly captivating production. From the moment we played the first song to the children, they were hooked and strains of 'Nothing Beats Being You' and 'Tierra del Fuego' could be heard drifting down the corridors. Proof of its popularity was witnessed when the children performed their own, impromptu, jamming session of Darwin Rocks with true passion and abandon after the first performance. The jokes worked on two levels, both for children and adults (?! ), meaning that every audience member fully enjoyed the show. It was easy to stage, with brilliant parts for an entire year group and the accolades we have received after the performance have been the best ever. Well done, and thank you, Steve Titford and Musicline! "